Watch us as we create art everywhere that we go. What an emotional day with Jessica and Jordan. So many tears throughout this day! 😍😍😍 Real question. For our wedding vows in Mount Zion, I (Ernie) is going to wear a wine suit... but should I rock the all wine suit from jacket to pant or should I rock the wine jacket with black pant? This is a real thing I am debating over! I need your help and I dropped a poll in the stories to figure it out. 🙌🙌🙌 Also, we just selected out AirBNB for Utah that is going to have our whole crew out there and it is so 🔥🔥🔥 🔥🔥 I will share photos of the Airbnb right after we get it all booked up this weekend. 😊😊😊 I guess I should write a little about this couple! Can’t wait till next year when we get to their wedding! It’s going to be awesome! They were so fun and made some amazing images. Also, they will be the first time we ever shoot at the Brick which is sorta insane to me. Unless someone else sneaks one in before them. 😊 Also, I like that song with “horses in the back”. No judgement please! Loved being able to create during this engagement session in Laguna Beach. Amazing red dress and some amazing views! Loved hanging with Jess and Monica for their engagement session. The first one was rained out and we were able to sneak this one in right before their wedding! We had the opportunity to try something a little new during this engagement session. We got into the water and were able to catch some truly magical moments. Thinking of trying some new concepts like that! Love these two so much! So honored to be able to capture the proposal for Michael and Macy! We were honored to be able to capture this amazing proposal in Harmony Grove! Sally and Kenny are amazing and we cannot wait to capture their wedding in a couple of months. They are going to be amazing! The fog was rolling through and the light was running away quickly, but the moments that were created on this day will last a lifetime. We had so much fun capturing the day with David and Megan at Balboa Park for their engagement session. Check out the photos here from their day. We are able to capture some of the best moments! We were able to capture the photos and video for Shelley and Keith for this amazing proposal. Check out the video and photos here. We were out at Balboa Park for this awesome engagement session. We love everything about Balboa Park's beauty. There are so many locations to shoot and so many amazing images that we can create there. Check out the sneak peeks from this engagement session. We were honored to capture the engagement photos of Cameron and Amanda in downtown San Diego at the beginning of the month. Check out the photos from the shoot here. Cameron and Amanda are such a fun couple! We loved cruising around downtown San Diego with them to create some amazing images for their engagement portraits. The session was full of laughs. Check out the sneak peek of photos from the shoot here. We created a signature album for Colin and Sarina. The album will be placed out during their wedding and the guests will be able to write a few notes in it for them. They will also get to see some of the great photos that they took during their engagement session. Check out the photos here. We were given the opportunity to capture this proposal out at Centennial Park in Coronado a couple of weeks ago. 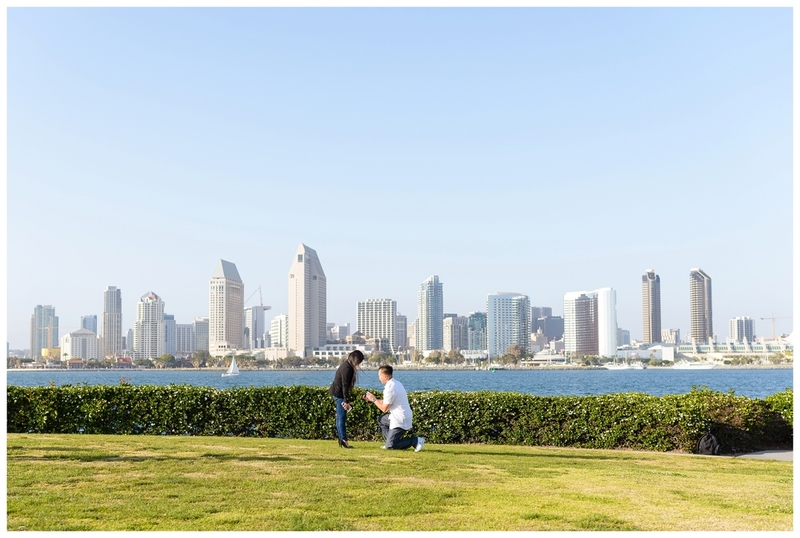 David planned to drop down to one knee right in front of the beautiful San Diego skyline. The plan was to walk out at the park and caricature artist was going to ask them if they would like a drawing made of them. The drawing that he would show to them would be of David dropped down to one knee asking for Megan to be his bride. What an amazing time we had with Colin and Sarina wandering around Julian. We had some apple pies and we found some amazing light for their engagement session. Check out some of the images below from their great day.